Another weekend has flown by too quickly! Little Rock was fun- I always feel pressed for time though, when we drive down on a Saturday and leave the next day. I wish Little Rock was an hour away instead of 2.5…and Brock will tell you I am not the most patient road trip passenger. We visited his mom, dad, and brother on Saturday, and watched the Razorbacks play some basketball against LSU…and unfortunately LSU won in the last few seconds of the game by a few points. Later that night we headed out to the Promenade, did some shopping and got some friends and cousins together for dinner at Local Lime! If you EVER happen to be in Little Rock, you’ve gotta check this place out. They claim to have the best frozen margarita, and they most definitely do. Several margaritas later we ended up at Professor Bowl, a bowling place that has over 100 different types of craft beers, and an arcade room that has seen better days. We had such a blast playing and drinking with friends though! My coworker LP (she’s been pictured on here before!) and her boyfriend also met up with us. We may have not been the best bowlers but it was still fun. On Sunday we had a quick brunch with one of Brock’s brothers and headed home, with a sleepy pup in the back of the car. Now it’s Monday…and it’s gloomy outside and I have my leadership class in a few hours. I don’t mind the class, but it makes my Mondays very long, and I don’t really get to spend much time with Brock or eat dinner (unless you count eating a sad protein bar as dinner). 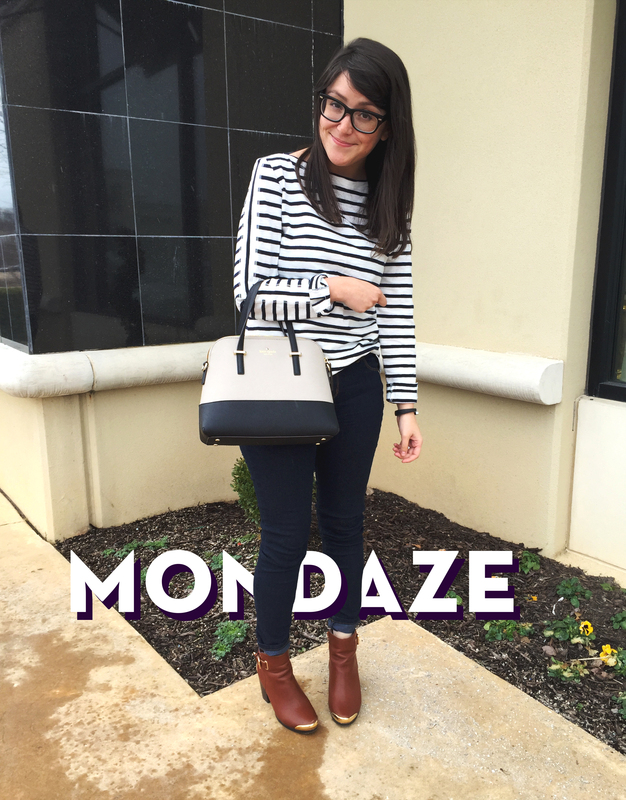 Today I’m wearing my new favorite striped top from Jcrew and my favorite Kate Spade bag. I didn’t blow dry my hair last night but I tried to look decent for a photo. Jcrew has some really adorable spring clothes out right now and I am SO excited about finally wearing my Panama hat I bought last year when the weather warms up. It seems wrong to wear one in the dead of winter. What are you excited to wear when the snow thaws over? Thank goodness the weather is starting to warm up– I’m loving that striped top on you! Let me say, I’m in love with your top and your booties….I always like your post too! sounds like you had a fun weekend! ❤ I love your entire outfit, and I especially love your striped top. I've been looking for one just like that 🙂 When the weather warms up, I'm excited to start wearing my favorite spring dresses once again. thanks! can’t wait to see what cute spring dresses you have in your wardrobe! I need to invest in some for sure.